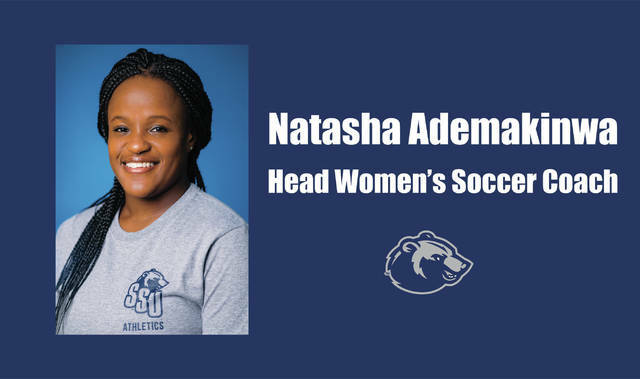 Shawnee State’s Natasha Ademakinwa as the fourth women’s soccer coach in program history in an official press release that was sent out on Thursday afternoon. The Shawnee State Athletic Department announced the hiring of Natasha Ademakinwa as the fourth women’s soccer coach in program history in an official press release that was sent out on Thursday afternoon. Ademakinwa was mostly recently the head coach of the women’s club soccer team at West Virginia University. She led WVU to a 7-0-0 season, winning the NIRSA Region One Pennsylvania West Division Championship and qualifying for the NIRSA National Tournament. Ademakinwa also has coaching experience in her home country, as she has managed multiple developmental teams. Most recently, she was head boys coach for the Millwall Lionesses, being head coach for the under-13 girls and assistant coach for the 15-under and 17-under teams from 2014 to 2016. She also spent two stints as a head boys coach at Isledon Wolves Boys’ Football Club in London, where she coached both under-8s and under-14s in parts of nine seasons. Her original stint with Isledon was from 2006 to 2010, with her second stint running from 2012 to 2015. In that time with Isledon, she led the teams to championships in the Camden & Isledon League B Division two times and to a championship in the A Division once. She also led the teams to a championship in the Harrow Youth League Division IV, seeing promotion to Division II, and later won a championship in Division II, earning promotion to the Harrow Youth Premier League. She was also named Isledon Wolves FC Coach of the Year in 2009 and 2015, respectively. Ademakinwa was also an assistant under-13 and under-16 coach at Queens Park Rangers Ladies Football Club in London in 2013; prior to that, she spent one season as the head coach of the reserve team at Camden Town Ladies Football Club in London. Ademakinwa also coached at Leyton Orient Girls Football Academy Centre of Excellence, coaching under-12s there from December of 2009 to August 2010. During that same time, she was also an assistant boys under-14 and under-16 coach at London Athletic Youth Football Club, coaching there from April 2009 to August 2010. Prior to that, she was the soccer coach at Hendon Women’s Football Club in London from July to August of 2008 and served as the under-12 and under-13 assistant girls soccer coach at Hendon Youth Football Club from January 2004 to December 2006. Ademakinwa’s first coaching experience came at the Camden Development Project, helping coach at-risk youths in under-11 and under-12 teams, came from January 2001 to December of 2004. Ademakinwa has also had a distinguished playing career, having played both collegiately in the United States and semi-professionally in England. Ademakinwa played one season at Ohio Valley University (W. Va.), tallying one assist in 14 games in the 2010 season. Most notably, Ademakinwa played semiprofessionally for two London-based clubs, having played for AFC Wimbledon’s ladies team and for Tottenham Hotspur Ladies Football Club. Ademakinwa has two Bachelor’s degrees, earning a Bachelor of Science in Psychology with Health Studies at the University of East London in 2009. She earned her second degree in Sport Management from Ohio Valley University in 2012. Ademakinwa just completed a graduate degree, earning a Master’s of Science in Sports Education and Coaching this past May. Ademakinwa will get her first season underway on Thursday, Aug. 23 at Cincinnati Christian University. Kickoff is set for 7 p.m.